Founded in 1981, Gate 1 Travel now boasts more than 400 employees in their international offices that coordinate a collection of tour destinations around the world. The company's goal is to provide travelers with greater value on trips that exceed expectations. Gate 1 Travel offers fully escorted land tours, sea cruises, independent rail packages, river cruises, independent fly and drive vacations plus customized international vacation packages throughout Europe, Asia, Africa, Australia and North/South America. Gate 1 Travel's custom ship, Monarch Empress, features modern, clean lines and neutral tones. Cabins, for example, are done in blue and white with cherry wood accents. Most include a French balcony. Other amenities include a fitness center, putting green, a library and a sun deck. Monarch Queen has a more traditional, Old World European feel, while Monach Duchess, a former Avalon ship, is more contemporary. 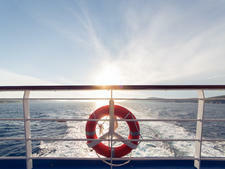 Both ships offer amenities including a spa and fitness center. On all three ships, afternoon tea is served while cruising. A daily late-night snack is also offered in the lounge and an onboard musician performs in the afternoon and after dinner. While a walking or coach tour is included in each port, some excursions that are included on other lines, such as a trip to Heidelberg or Colmar, carry an optional fee on Gate 1 Travel. This allows passengers to pay for only the excursions they want, while keeping the base price lower. Gate 1 Travel river cruisers are budget conscious savvy travelers that demand value without sacrificing quality. The majority originates from the U.S., Canada or Australia. Each sailing boasts a comfortable mix of seasoned travelers along with less frequent travelers, even some first-time visitors to Europe. 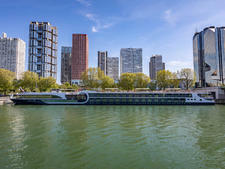 While river cruises are generally most appealing for travelers 50+, ages and income levels vary. Gate 1 Travel owns and operates the Monarch Empress, a 360-foot-long river ship that sails a variety of itineraries on the Danube River between April and November. It can accommodate 144 passengers. Gate 1 Travel also offers itineraries on two fully chartered ships: Monarch Duchess and Monarch Queen, both 360 feet long with capacity for 146 passengers. 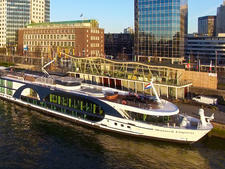 Monarch Duchess sails multiple itineraries on the Rhine River between March and October. Monarch Queen begins the sailing season in late March in Holland and Belgium and later offers multiple cruises on the Danube, Main and Rhine Rivers. The company also sells river cruises run by third-party operators in Russia, China, Vietnam and Cambodia and Myanmar (Burma). 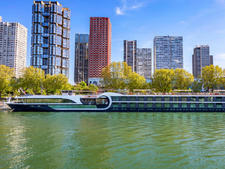 It also has an ocean cruise arm that books packages on Norwegian Cruise Line in the Western and Eastern Mediterranean, the Atlantic Ocean and Caribbean and Alaska. Gate 1 Travel offers river cruises on the Danube, Rhine, Main, Svir, Volga, Yangtze, Mekong and Irrawaddy rivers. The Danube, Rhine and waterways of Holland are the most popular.